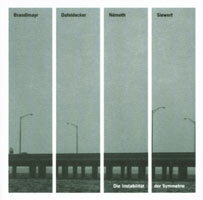 Die Instabilität der Symmetrie– one could see this title as a programmatic reference to the work of improvisation. Improvisation is something that suspends a well ordered (or ”symmetrical”) structure and refers to the relativity of musical organization. So far, so classical. These improvisations are, however, characterized by what isn’t played (the clichés of the expressive playing one’s trumps are not to be heard). It is a terse, clearly formulated music that leaves much out, but is neither minimalistic nor monochrome. There are suggestions, abbreviations, fragments, small structural elements that we do not have to perceive as such, since they yield a whole picture: this music is completely and properly formulated. It says less than necessary, but more than possible. Die Instabilität der Symmetrie organizes the sound of improvised music anew. Not only the ”composed symmetry,” but also the specific (improvised) symmetry is confused. Martin Siewert, guitarist, composer and producer of this album, often works with bands: Efzeg (GROB 430), SSSD (GROB 431), or Trapist. The quartet of ”Instability” does not exist as a working band (which does not mean, however, you cannot book them). The network between the musicians, however, is so dense that their music rests upon a dream-like understanding. Martin Siewert plays with Werner Dafeldecker (contrabass, electronics, last on Lichtgeschwindigkeit [Speed of Light], GROB 541 with Klaus Lang)in SSSD; Dafeldecker works with Siewert and Martin Brandlmayr (drums) and others on a pop project; Brandlmayr and Siewert have released a duo album on Erstwhile and make up 2/3rds of Trapist; Brandlmayr and Stefan Nemeth (electronics) can be heard above all in Radian; and Stefan Nemeth will soon run a label that will produce solo recordings from Siewert and Brandlmayr. Die Instabilität der Symmetrie is a co-production with the Viennese label dOc recordings. The recordings originated during a concert at the Viennese Museum for Applied Art on April 2, 2002, a track without Dafeldecker was recorded a year earlier.